Over time, industrialization (of services) has come to mean standardization, routinization and ultimately the McDonaldization of services. What is meant by this term and what might be the downsides of the McDonaldization of services? Many writers have argued that services should be run like factories to increase efficiency and productivity. It was believed that by adopting the predictability of the factory system, disruptions caused by people (employees and customers) in services would be minimized. This type of thinking and action is still prevalent today, arousing much controversy. Today, this factorization of services is often referred to as the McDonaldization of Services, with an obvious reference to the productivity of a fast food chain restaurant. Through the use of rules, regulations, scripts and technology, services are supposed to control the behavior of employees and customers. Just as the production side of service has been industrialized, organizations have pursued a similar approach for managing the tensions and unpredictability on the consumption side. The term McDonaldization was brought about by Ritzer, who defines it as “the process by which the principles of the fast-food restaurant are coming to dominate more and more sectors of American society as well as the rest of the world”. He attributes its success to four dimensions (efficiency, calculability, predictability and control) seemingly attractive to employees, customers and management. 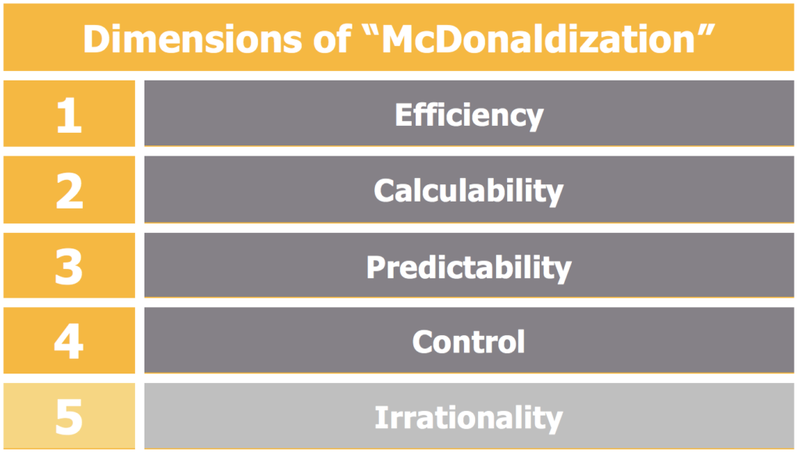 Let’s investigate these four dimensions more closely to understand the McDonaldization of Services concept. Efficiency is regarded as the optimum method for getting from one point to another. The McDonald’s restaurant offers the best available way to get from being hungry to being full. Customers see it as the quickest way to satisfy a need. Employees are also said to gain. By clearly defining what is to be done and how it is to be done, tasks are performed more rapidly and easily. Finally, for service management, efficiency means getting the most output from the least input, maximizing profitability. Calculability emphasizes calculating, counting, quantifying etc. Steps in the service process are measured for the time they take and those that take the least are deemed the most efficient. Calculability, thus, makes it easier to determine efficiency. Predictability means order, certainty, and knowing what to expect. It suggests, for a service, that it can be pre-programmed, so that surprises are unlikely. Both customers and service provider know what is going to happen, where, when and how. Therefore, predictability, as well as calculability, facilitates efficiency. Control is the fourth dimension of the McDonaldization of Services. It is exerted through the substitution of non-humans for human technology. A human technology (e.g. a screwdriver) is controlled by people; a non-human technology (e.g. assembly line) controls people. The ultimate stage in control is, of course, where people are replaced by machines. It is also important to remember that control (of employees and customers) is exerted in many other ways in services, e.g. through the use of scripts and the design of interior facilities. Ritzer acknowledges the benefits of efficiency, predictability, calculability and control. However, with the addition of a fifth dimension, the irrationality or rationality, he highlights the negative aspects of McDonaldization. Through relentless standardization and numbing routines, both employees and customers can feel dehumanized and depersonalized. As employees are made to become more robotic-like in their behavior, stress and a sense of loss of identity may follow. Customers feel as though they are part of an assembly line. Frustration, for both parties, is a likely outcome, which in turn may have an adverse affect on service quality. So, the McDonaldization of Services, in fact, brings about benefits and disadvantages and should be critically assessed before implementation.